Do you love going on fun adventures with your own dog? In our family, we love to go hiking and exploring with Reya. It is not too uncommon to see Reya in her backpack with water and treats as we go on a long walk or just enjoy nature. Of course, any adventure needs good gear, even for dogs. Since its hard finding well made gear, especially for large dogs like us, we were excited when we heard about Alcott Adventures! When we heard they wanted us to remove some of their amazing products, we were obviously ecstatic! Ready to go on a fun adventure with your dog? Alcott Adventures offers dogs and their owners a full line of gear and accessories that can turn even a normal walk into an adventure. All of their products are designed to be easy to use for humans, comfortable, and safe for dogs. With their full lines of products for land or sea, you can fun everywhere with Alcott! Love the idea of sleeping under the stars with your favorite pup? If so, we think you will love Alcott Adventures Pup Tent. This cute tent is designed to protect your dog from the elements and be large enough to accommodate most beds, including doggy sleeping bags. With four ventilation panels, dogs can even watch over their humans as they sleep. When we first got this tent, we were impressed that it was compact and easy to put together. It was also very spacious, allowing our Alaskan Malamute the chance to stretch out and feel comfortable in this home away from home. While we have this bed indoors (it’s snowing outside), it does come with its own stakes to keep it in place while you are camping. 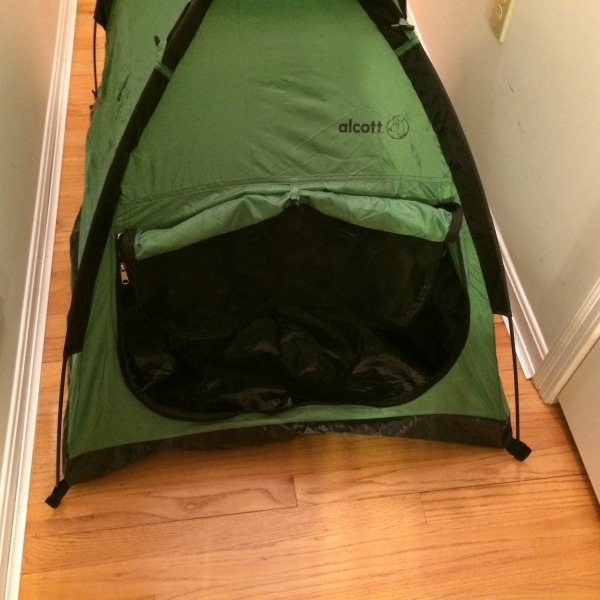 Based on our own experience, we are happy to give the Alcott Adventures Pup Tent an A+ rating! Looking for a way to make traveling at night safer for you and your dog? 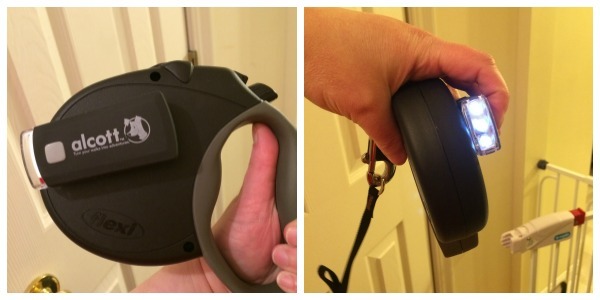 If so, we think you are going to love Alcott Adventures Retractable Leash Light. This special flashlight attached to your retractable leas hand features 3 LED lights. These bulbs can last for up to 100,000 hours and can go give constant light or blink. Just make sure you have 2 AAA batteries before you go walking. So far, this light has been very useful for us, especially with it being darker during the winter months. Based on our own experience with this light, we are happy to give the Alcott Adventures Retractable Leash Light an A rating! Would you like to purchase some of the amazing products featured in this review? You can find them at Alcott Adventures or see if they are available at your local pet store using their store locator. To shop on their website, remember you can do it in one of two ways, by using their categories or by the type of adventure you want to go on with your favorite dog. Also, don’t forget that they made sizing easier for humans. If your dog takes one of their medium collars, you will be able to use a medium size in all their products! 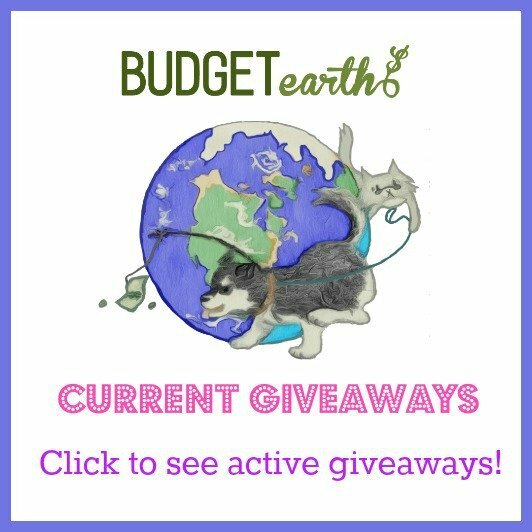 Want to win some amazing dog products? We are excited to be working with Alcott Adventures on this amazing giveaway! One of our lucky readers will win a $25 Gift Code for Alcott Adventures. To learn more, make sure to read the rules below and then enter through the Rafflecopter. One lucky reader will win $25 Alcott Adventure Gift Code. Sweepstakes ends March 23 at 11:59pm ET. I think that the adventure jacket and the little doggie booties look adorable. My daughter loves to dress up our little dog and this would be wonderful for her! They have so many great products, it’s hard to pick just one. I love the style of some of their harnesses, but really love the style of the Adventure Jacket (I would need to figure out if they have one big enough for my hounds). I really like the flexi retractable leash. My son and daughter-in-law just have regular leashes for their dogs, and whenever I am taking care of them, I just feel like they are dragging me along. Maybe the retractable leashes would help me not feel like I have to run to keep up with them. I love the sleeping bag, my puppy would love that. I love the sleeping bag, my puppy would love to have something like that. My chocolate lab loves the water! Sometimes we don’t bring him with us because of how much water he seems to hold. I would love to try the beach blanket! I definitely could use the adventure collar and leash. The harness would be handy to keep my dog from almost choking himself when he runs the length of the leash. I would love to try the visibility adventure collar. This would be great for early morning walks. Its always scary when it’s too dark for cars to see you! I love the explorer Pup Tent for $39.99! It is the perfect size for my puppy! 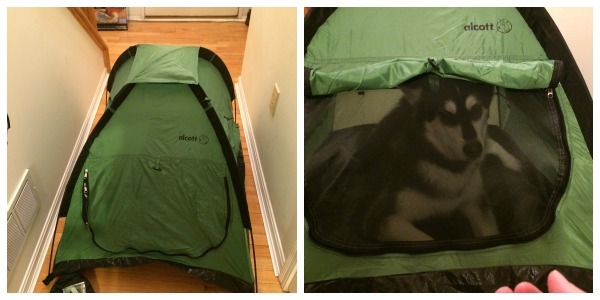 My daughter loves to camp out and she could use this for him when camping out in the backyard! Too darned cute! Thanks for the fabulous review and giveaway! Brutus the boxer loves to travel. Although he rides really well, I would still love to have the car safety belt just in case he gets crazy. Meme the giant 5 pound mixed breed l Ioves toys and I see some great teeats on the website. I hope that I win the giveaway so that I am able to buy Meme some surprises! Anything for my pom Butch ? They have lots of items for dogs of all sizes. It is one of the things I love about the site. They have items sized for a Yorky or Malamute. I love the outdoor blanket. Griffin comes to quite a few sporting events to watch the kids. He would love a blanket to lay on! I like the comfort bolster bed…my dogs like a place to rest their chin in bed! I like the adventure harness because within the last year my dachshund had to have one of her front legs amputated. We are having a hard time finding something to use for her. I think we could use the car safety belt. My little shih tzu loves the car more than anything but sometimes he gets a little too excited running from front to back! I like the mariner life jacket. We do a lot of boating and this would be perfect for my furry little Tipsy!